In the Library of Boujark, sometimes book reads you! I'm a librarian and I love your stuff. I don't know if I can afford it, but if the original art for this is available, please send me a quote: steve@stevelawson.name. Very cool. I love that it is in a pocket dimension and so can ignore physical laws. You've sussed it out! 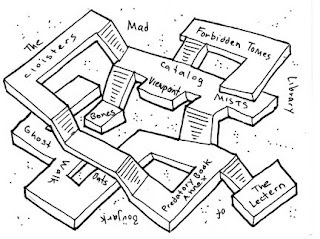 You can use this map to find the secret collection of spellbooks hidden in the basement.